Wildcat Band & Auxiliary Parent Organization, Inc. The Wildcat Band & Auxiliary Parent Organization, Inc. (WBAPO) is an Oregon non-profit/tax-exempt organization that exists to provide financial, moral and volunteer support to make this wonderful experience possible for our children. Support and involvement from every parent provides the best possible program. In addition to being personally rewarding, volunteering is as much fun for the parents as it is for the students! Every parent or guardian of a student in the band program is automatically a member of WBAPO. Parents are welcome and encouraged to attend monthly meetings at WHS, and take part in volunteer activities to support the program. Click here for names and contact information of current Parent Officers. The Executive Committee consists of four Parent Officers: a President, Vice President, Treasurer and Secretary. The officers are chosen in open elections at the May meeting. Any parent may run or volunteer for these positions, and all parents are eligible to vote. The Executive Committee meets separately every 1-2 months throughout the school year, and works closely with the band staff to manage the band and guard programs from a financial and organizational point-of-view. 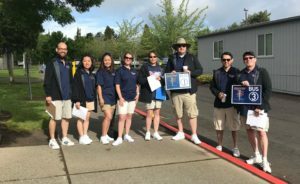 Among other duties, Parent Officers are responsible for communicating with the parent base, planning large trips and events, tracking finances and managing fundraisers, purchasing large-ticket items, mobilizing committees, and supporting the educational philosophies of the Band Director, Westview High School, and the Beaverton School District. WBAPO holds monthly meetings at Westview (typically the first Wednesday evening of each month) from August-November and January-May. The meetings are a forum to share information about the band programs, upcoming events, schedules, budget and fundraising status, and volunteer needs. The Band Director and other staff are usually present to provide reports about the program and answer any questions. All band parents are encouraged to attend meetings as often as possible. Reminders are sent out via email and the online calendar. The Secretary records minutes of each parent meeting. The minutes are posted here so that parents can keep up to date on information and decisions when they are unable to attend. Click here for names and contact information of current Committee Leads. Every year, a handful of designated parents coordinate small committees that support specific activities of our students. Each Committee Head has a team of several other parents to help achieve their goals. Volunteers are always needed and welcome! It is hoped and relied upon that volunteers with experience in a particular committee will step forward to lead that committee when parents of older students move on after their children graduate. Volunteers are at the heart of everything WBAPO does! The Volunteer Coordinator organizes volunteers for band functions to make sure things run smoothly. Chaperones accompany the bands on trips to parades, festivals, competitions, and other off-campus trips short or long. The Chaperone Coordinator does not necessarily have to go on every trip, but is responsible for making sure there are parents for each trip. Typically two parents per bus are needed; most Concert ensemble trips require 1-2 buses and the Marching Band require 2-3. The Volunteer Coordinator also makes sure enough parents are available to go on longer trips to farther away destinations (specific needs differ on a year-to-year basis). Traveling with band members on a school bus is actually quite fun and generates a lot of excitement among the band members. Riding along gives you a front seat to the action! Confirming the presence of students on the bus before departures. Assisting with minor first aid if needed. Alleviating the staff by answering basic questions and directing students where to go. Supervising students and help spread information and directions. Uniforms are an important part of every performance whether it is in a gym, on a football field, or featured under the lights of a stage. Financially, uniforms are a substantial investment for the program. A number of parents work together throughout the year to make sure our students look sharp and keep the uniforms in good condition. 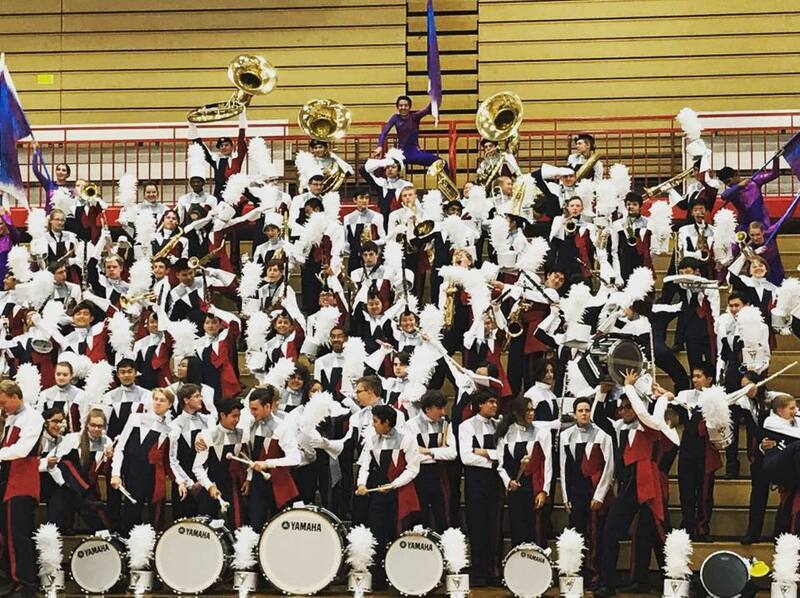 Uniform pieces include tuxedos and black dresses for the Wind Ensemble, cummerbunds or vests and bow-ties for the Symphonic and Concert Bands, and jackets, bibs, baldrics, shakos, gauntlets, and gloves for the Wildcat Marching Band (Colorguard members typically take care of their own costuming). Often, one parent will manage Marching Band uniforms for the year while another manages the Concert ensembles. However, it is possible for an adventurous individual to do both! Fitting and checking out concert uniforms at the beginning of the year. Fitting and checking out marching uniforms at the beginning of the Fall marching season. Adjusting and maintaining uniforms at festivals, concerts and other events. Coordinating the cleaning and mending of uniforms at the end of the season(s). Tracking uniform assignments throughout the year. Collecting uniforms from students at the end of the year. “The Pit” refers to marimbas, xylophones, vibraphones, chimes, synthesizers, gongs and other large, non-marching percussion instruments. They are a key part of both the Wildcat Marching Band and Westview Winter Percussion ensembles. Loading, transporting, and staging these instruments is the responsibility of the Pit Crew. Maintaining two sheds on the Westview HS campus that store much of the equipment. Picking up and driving a rented equipment truck (e.g., U-Haul) to WHS and performance sites. Loading equipment at WHS before leaving for, and after returning from, performance sites. At home football games, efficiently moving equipment into the end zone staging area before halftime. At home football games, efficiently moving equipment on and off the field immediately before/after halftime performances. 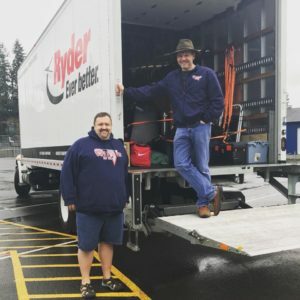 At marching band festivals, efficiently moving equipment on and off the field immediately before/after competitive performances. 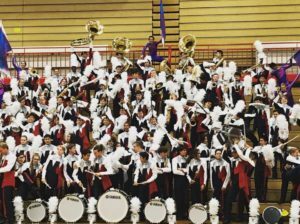 The competitions are timed, so efficient set up and tear down of the pit during the “total time interval” is a critical part of the band’s competitive success! At winter percussion festivals (February – April), efficiently moving equipment on and off the gym floor immediately before/after competitive performances. Like the Marching Band, the winter compeitions are timed! SCRIP is a major source of funds for individual families to support their child(ren)’s participation in the band programs. Many families earn a substantial portion (even all!) of their fees by using SCRIP every year. The SCRIP Committee Head maintains the continuity of, and access to, this program. Receiving and processin SCRIP orders from band families. Submitting orders to the SCRIP organization. Maintaining a stock of the most popular SCRIP items to sell to band families. Periodically picking up SCRIP orders from the SCRIP center in Tigard. Distributing orders to the band families. Honestly, what committee could be more valued by a teenager?! 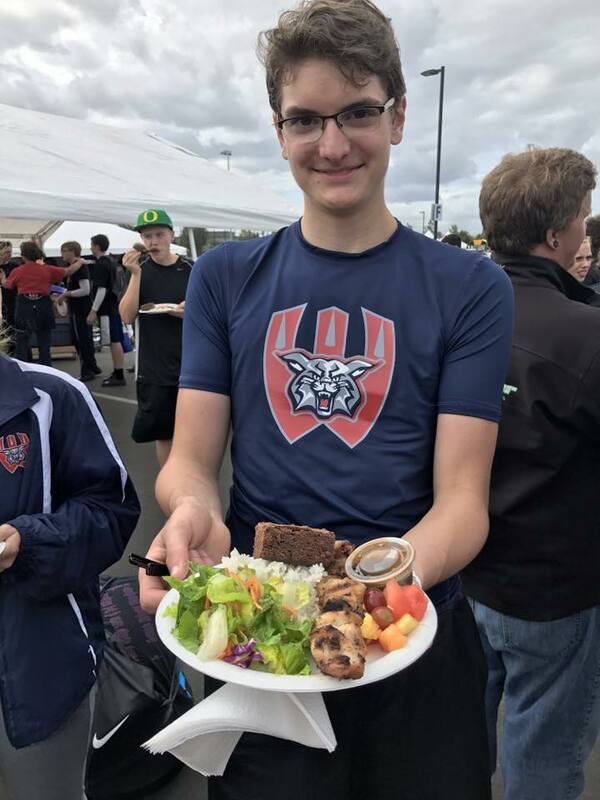 The Food Committee prepares and serves meals primarily to the Marching Band members and staff at band festivals, and to attending Chaperones and Volunteers for a nominal charge of about $5. The objective is to provide a warm, healthy meal for kids to regain their energy and stave off hunger. Collective meals are more than just nourishment; eating together builds a sense of family, support, and co-dependence. In more ways than one, we love good food! Shopping for food and dining supplies (plates, cups, utensils, etc.) during the few days before a festival. Loading and transporting food and cooking equipment to the performance site. Preparing food at the performance site and setting up a buffet line. Cleaning up the feed site after each meal. The Garage Sale, held for 3 days each August in the WHS parking lot, is one of our largest annual fund-raising project for WBAPO. It requires a short-term but intense effort to pull off successfully. Typically, the sale opens on a Thursday, runs through Friday, and closes around noon-2pm on Saturday. Soliciting donations from community members (including band families) for salable items. Setting up tables and canopies for displaying sale items. Supervising the cashier and cash-box. Coordinating after-hours supervision of the sale site. Cleaning up on the final day. Marching Band members are enlisted by the director to help with the bulk of this task! A small committee must begin planning for the sale in late spring; during the sale, a larger team of volunteers shares the burden of work on the sale days. The Beaverton School District pays the salary of the band director and provides the band room facility. Virtually all other costs are covered by WBAPO through other funding sources. The total, annual budget for the band program is more than $85,000.00. This amount is funded in part through fundraising activities, but the remainder must be paid-in through “Fair Share” Participation Fees charged per student. The fees are comparable to those charged by other, similar band programs in the Northwest and are analogous to the participation fees charged by athletic teams. It is the sincere belief of WBAPO that, given the relatively low amount of money for the relatively high number of experiences provided, WBAPO’s fees are an incredible deal for any family. 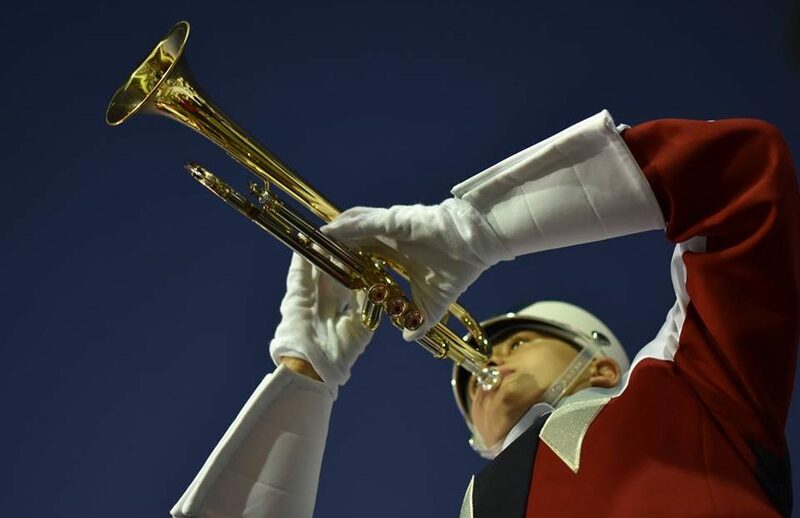 Combined with hand-picked fundraising opportunities and the creation of lifelong skills, friends, and memories among students, paying band fees is money well-invested in your child’s future. 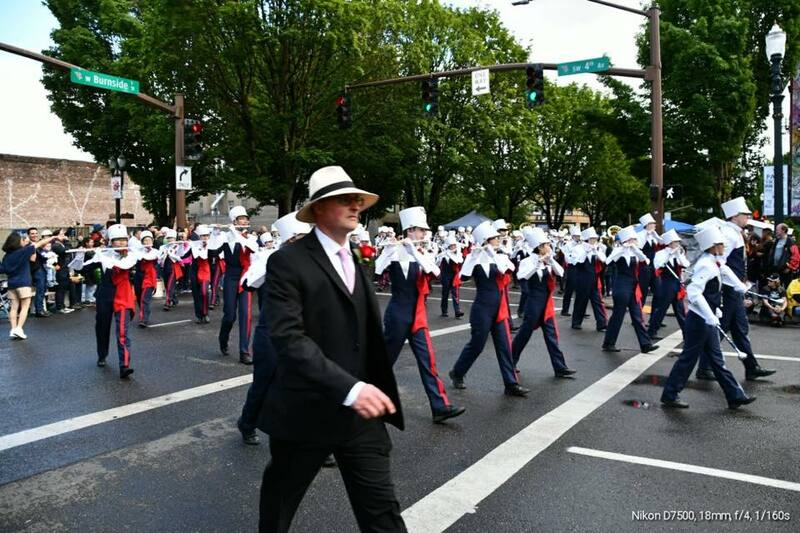 Annual budgeted expenses cover many areas, including: expenses for concert season; classroom instruction from area musicians; Rose Festival Parade; Fall marching band season; Winter Percussion; Winterguard; various nominal fundraising expenses; and operating expenses. The parent group also uses funds raised through each family’s Fair Share Participation Fees to purchase and maintain large instruments, uniforms, and other equipment necessary for the entire program. Through various fundraising programs, the parent group attempts to defray as much of the program expense as possible. Unfortunately, the fundraising efforts can cover only part of the expense involved, so fees must be charged. For questions about fee usages, management of funds, or to request a detailed copy of the WBAPO annual budget, feel free to contact any Parent Officer. It is understood that Fair Share Participation Fees create a burden. No student shall be excluded from the band or guard program(s) because of the fees. There are a number of fundraising programs available that allow students and/or parents to offset a portion of their fees (in fact, many students pay most or even all of their fees through steady participation in fundraisers). In addition, a limited amount of scholarship funding is usually available to assist (in part) those students who are simply unable to cover their fees. To inquire about scholarship funds, please contact the Band Director, or the WBAPO President or Treasurer. You can download the Scholarship Guidelines and Application by visiting our Document & Forms page.